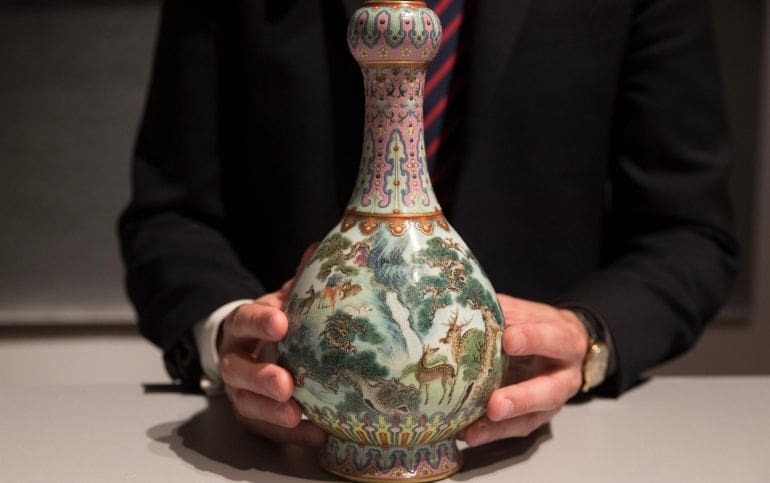 An exceptionally ornate 18th-century Chinese vase, discovered inside a forgotten shoebox in a French attic, has just been bought for a whopping $19 million (approx. €16.2 million). 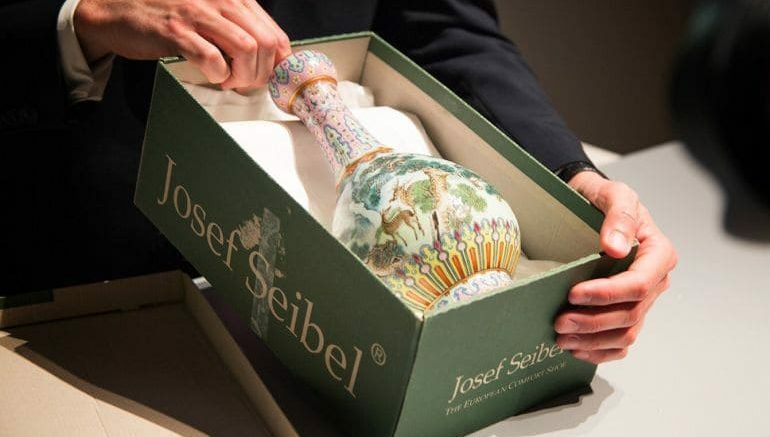 The precious artifact, which was sold yesterday at an auction held in Sotheby’s Paris, fetched more than 30 times the original estimate of $588,573.5 (around €500,000). This is a major work of art, it is as if we had just discovered a Caravaggio. This person (the seller) took the train, then the metro and walked on foot through the doors of Sotheby’s and into my office with the vase in a shoebox protected by na ewspaper. When she put the box on my desk and we opened it we were all stunned by the beauty of the piece. We didn’t like the vase too much, and my grandparents didn’t like it either. They knew it had some value but nothing like that, nor that it was from the Qian dynasty. The auction lasted some 20 minutes, with the highest bid coming from an anonymous Chinese collector. As per Valmier, the sale price of $19 million – which incidentally is the highest ever recorded by Sotheby’s Paris – included $2.35 million (€2 million) in auction costs and commissions. Porcelains with such elaborate and challenging designs are exceedingly rare on Qing imperial porcelain and did not form part of the imperial kilns’ regular production lines. Interestingly, earlier in April, a rare Qing Dynasty bowl – crafted for Emperor Kangxi – was sold for an incredible $30.4 million. 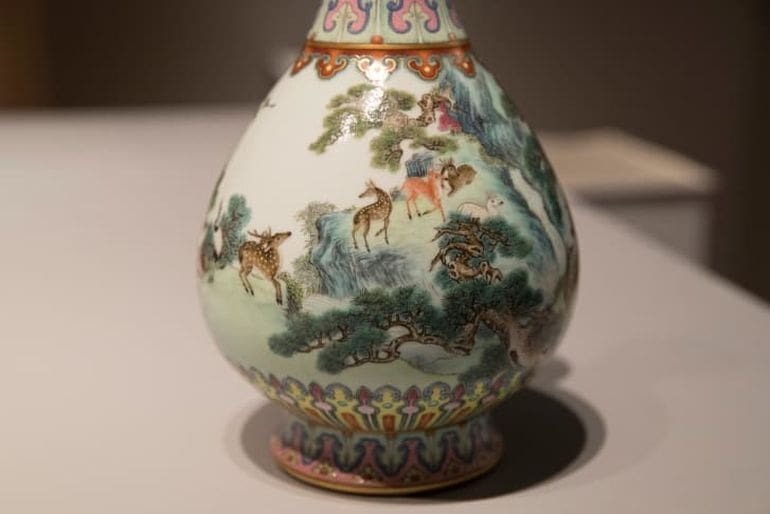 Dating back to the early part of the 18th century, the item is among the rare porcelain artefacts from the Chinese Qing period that have garnered worldwide attention in recent times.